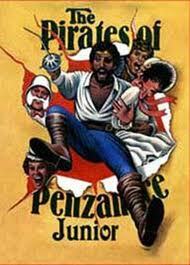 In The Pirates of Penzance, the young pirate apprentice Frederic is about to be freed from his indentured period. The honorable Frederic, who was mistakenly apprenticed to the pirates by his partially deaf nursemaid Ruth, has decided to leave the pirate life. Now a free man, Frederic leaves for the shore. Frederic, who has never seen a woman besides Ruth, instantly falls in love with Mabel, one of the daughters of Major­General Stanley. Soon though, the pirates arrive and want to marry the rest of Major­General Stanley's daughters. Major­General Stanley enlists the help of the police to stop the pirates. Frederic desires to help Major­General Stanley and the police protect the ladies, but soon he discovers that due to a technicality, he is still bound by duty to remain an apprentice to the pirates. All is well in the end when it is discovered that the pirates have noble blood and would in fact be suitable husbands for Major­General Stanley's daughters.